You can combine a manufacturer coupon with a store coupon/competitor coupon for each product. To get the best deal, buy a "buy one get one free" item and use a coupon on EACH item. Call your store manager to find out what competitor coupons they take. Check back every Tuesday for the latest deals! 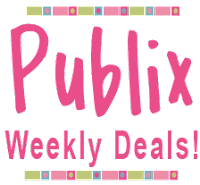 Thanks goes out to IHEARTPUBLIX.com for this weeks deals!